Jeff is a part of several exciting events this month, so watch for annoucements about them here on the blog and on Jeff’s social media accounts (Facebook and Twitter). His first event of the month will be a reading in Columbus, Ohio on Sunday, March 18, at 2pm. Jeff will read from his novel, Insatiable, at Club Diversity. Insatiable continues the tale of Jeff’s viking vampire, Derek, and his boyfriend, who take on the evils of mountaintop removal. 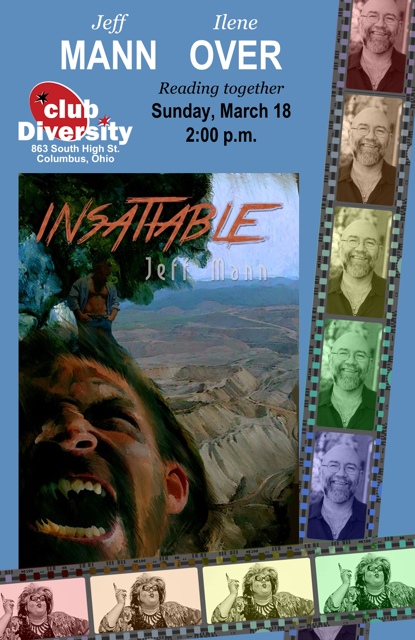 Copies of Insatiable will be avaiable and Jeff will be signing books after the reading. So join Jeff at Club Diversity on Sunday, March 18, 2018 at 2:00 P.M.